(with Matthew Chambers, Sayre Gomez, Rudy K. Slobeck, and others),” 2015. 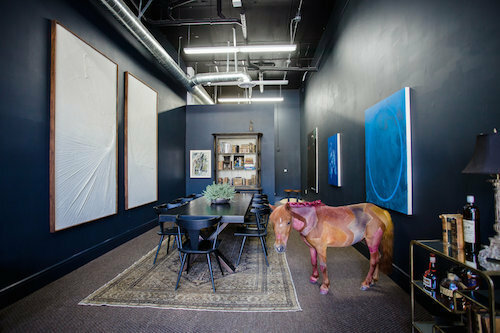 For his latest outing, Joe Sola lets a live miniature horse named Riba roam free in this gallery, which has been transformed to resemble the dining room of a well-off collector. The horse’s fur has been painted in an abstract design suggesting fanciful reinterpretations of ungulate fur patterns (giraffe, zebra, gazelle), running heavy on the red and brown. Her presence is both calming and inscrutable. Riba seems quite content to wander around the small gallery space, standing patiently before paintings and drawings by Matthew Chambers, Sayre Gomez, Rudy K. Slobeck, and others. This is not a group show, however; one of Sola’s most interesting moves is to use these artworks as part of an interactive installation. All of the pieces are abstractions (except for two small figurative paintings, which seem to function as portraits of the fictional collector and his wife). Likewise, Riba is a kind of living abstract painting. Just as these works are valuable within a highly cultivated economy, so are mini horses—they have, since the seventeenth century, been bred as exotic pets. Sola provokes dialogue about the economics of collecting. How does cultural value cohere around objects of visual pleasure, including things as disparate as living creatures and art?